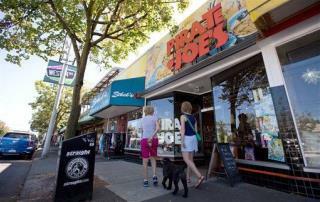 (Newser) – The "renegade" grocery store bringing Canadians a taste of Trader Joe's might be in jeopardy once again: The 9th Circuit Court of Appeals has revived a 2013 lawsuit the US grocery store brought against Pirate Joe's—a Vancouver, BC, store run by Michael Hallatt, who buys goods at Trader Joe's across the border, then sells them for a profit in Canada, where Trader Joe's doesn't operate, per the Guardian. A US judge initially dismissed the suit, arguing Trader Joe's couldn't prove Hallatt was affecting its business. But while a three-judge panel upheld the dismissal of certain claims from that suit on Friday, it allowed the case to continue on federal trademark claims in a unanimous decision, per Courthouse News. Next on Newser: Have Tasmanian Devils Found the Cure for Cancer? So where is customs in all this? The German family operation that owns Trader Joe's and many other market chains is an opera right now with charges and countercharges. Seems one branch is accusing the other of not living up to the frugal family image and more fun stuff.... so this is a sideshow. Everybody wins, no matter what happens!